For those of you feeling adventurous, I am proposing this Russian stock. There are plenty of risk factors, which is why I will start with them. If you are not deterred, you may consider this an intelligent speculation. But first something about the company. CTC Media (CTCM:US) is the only public Russian TV broadcaster. The holding company is organized as a Delaware corporation, listed on NASDAQ since mid-2006. CTC Media has 3 channels in Russia: CTC, Domashny, and Peretz. It also has one station in Kazakhstan and one in Moldova. Both are rather insignificant, generating just over 2% of total revenue. Actually, the flagship CTC network and CTC TV station account for 3/4 of revenues and for most of the operating income. It is the #4 top TV channel in Russia by audience share (the share of all people watching TV at a given time). Two of the remaining 4 in the top 5 are state-owned Channel One and Rossiya 1, and the other two two are Gazprom-controlled NTV and TNT. The two largest shareholders of CTC Media, Telcrest and MTG Russia, together own 63% of the company. Overall, as of end-2011, there were 20 free-to-air TV channels and networks with national coverage. The state-owned companies receive large subsidies and other benefits, so they are able to pay up for recent blockbusters, major sport events, game shows, serious news coverage, and local productions. This solidifies their leading positions. Nevertheless, free-market competition is gradually chipping away their advantage. On the graph, you see the average shares of the 4+ and the 14-44 (most commercially attractive) audience (left axis), and the technical penetration (right axis) or what percentage of the population in surveyed cities has access to these channels. 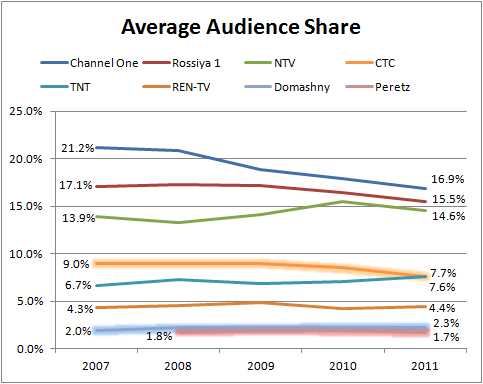 As of the first quarter of 2012, Domashny and Peretz reached record audience of 3.7% and 2.6% respectively. 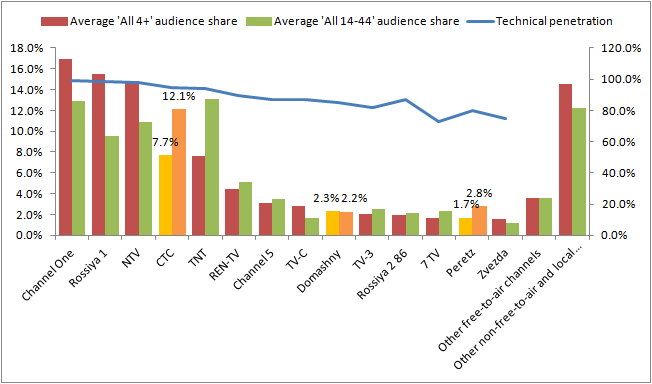 In terms of viewers in target demographic groups, CTC competes primarily with Channel One, NTV and TNT. Its principal target audience is 6-54 year-old viewers. Domashny competes primarily with Rossiya 1 and TV-C, targets 25-59 year-old female viewers. Peretz competes primarily with TV-3 and REN-TV, targets 25-59 year-old viewers. All three channels deliver entertainment content – sitcoms, sketchcoms, movies, animation, etc. – aimed at their respective target audiences. The programming is predominantly Russian, mixed with foreign productions. Lately, CTC Media has been integrating, with varying success, its in-house productions in its channels. The ability to produce its own quality content will give it a good advantage, but that’s a big if at his point. This graph shows the development of audience shares in the past 5 years. The last 2 years haven’t been good for CTC Media. Over the past 5 years, it has slipped less than state-owned companies, but Gazprom’s NTV and TNT have done better to capture the 4+ audience overall. However, CTC’s strength is with the 14-44 audience, which is the most commercially attractive. There, with 12.1%, it comes closely after TNT (13.1%) and Channel One (12.9%). The largest risk in emerging markets, and especially the Russian market, is the regulatory uncertainty. The legal framework is undergoing constant change. So, rules and regulations can change sporadically. As of 2011, due to monopoly concerns, TV broadcasters were prohibited from “signing agency agreements with media houses that hold a TV advertising market share greater than 35%.” Up to 2011, all of CTC’s advertising was was sold through Video International – the largest media house, controlling approximately 2/3 of the market. With the new law in force, CTC created its own sales house. But the relationship with Video International didn’t disappear. It just took a new form. CTC continued using Video International’s software platform, market intelligence, and back-office. Overall, CTC will be paying 10-12% of its Russian channels’ ad revenue to Video International and the payments won’t be netted, as they used to be, but will go to SG&A. Based on 2011 yearend numbers, the new arrangement didn’t have any discernible negative effect. Another law that could potentially get in the company’s way is the law regarding “foreign investments in economic entities that have strategic importance for defense and security of the state,” which restricts “direct or indirect non-Russian ownership in ‘‘strategically important’’ industries, including television broadcasters that broadcast to more than 50% of the population of a relevant constituent entity of the Russian Federation.” Any acquisition of such broadcasters will be quite impossible for CTC Media, limiting its ability to grow through acquisitions in Russia, and putting it at a disadvantage to its Russian competitors. This, however, doesn’t stop the company from acquiring small, regional stations to expand its reach. From time to time, there are discussions in the Russian government regarding imposing additional restrictions on television advertising, such as limiting the types of products that may be advertised, limiting product placements in programming, limiting the number of advertising breaks allowed in certain programs or requiring channels to devote more broadcast time to public service announcements. This Monday a full-fledged ban on alcohol ads went into effect in Russia. CTC Media doesn’t break out alcohol ad spend separately, but it shows that beer ads are 4.7% of total ad revenue in 2011. With the new law, $35m from beer commercials plus the remaining alcohol ad revenue will probably be gone – at least partially, depending on the loopholes in the law. With these risk factors in mind, here is what the company offers. CTC Media makes its money from ads. It keeps 75% of the ad time and gives 25% to the local TV stations that broadcast and promote CTC’s networks in their territory. CTC’s advertisers are 80% multinationals and 20% local companies. The 10 largest clients represented approximately 38% of total advertising revenue in 2011. The company has grown revenues every year except for 2009, when the financial crisis set it back. In 2010, it bounced back to pre-crisis levels and continued growing at about the rate of growth of the free-to-air TV ad market. Results for 2011 have been adjusted for the accounting change related to Video International. The Russian TV ad market is still in a development stage. It was the 5th largest in Europe and the 9th largest in the world in 2011. Despite the past 3 years having been a gradual return to pre-crisis levels, the TV ad market has grown at about 15% compounded annually for the past 8 years. Forecasts predict it will expand nearly 3 times in the coming 8 years, i.e., it will grow at about the same 15% rate as in the past 8 years. I discount this to the more modest expectation that if there will be any growth, it will be faster in developing countries. CTC Media has a solid balance sheet with no debt, apart from a $17m bank overdraft, and $130m cash. You can throw in $5m lease payments annually, but this doesn’t change the picture. A $129m dividend was paid in 2011 on $53m of profit. Dividends were first paid in 2010. The company doesn’t have a dividend policy and declares dividends on the go. The size of the dividend and its short history make it very likely that it is not sustainable at the current level, despite the company’s stated desire to stick to it. But it is good to know that management is willing to return cash to shareholders. Also, it is worth keeping in mind that results in 2011 were affected by a huge goodwill write-down in the Peretz network – $83m. Another $24m of impairments were recorded due to declining advertising market growth and the faltering economic stability worldwide. From its short history, it appears the company should be able to make $150-200m from operations under normal conditions. Then, there is the growing ad market in Russia. Even if it doesn’t grow at the estimated 15% rate in the next 8 years, which seems increasingly likely, it offers one of the better growth prospects in today’s sluggish economic environment. Besides, you won’t be paying for growth at the current price of $1.2b and falling. CTCM is trading close to its 52-week low. In the short term, with the ban on alcohol commercials and the global economic trouble, the price could go still lower. So, I suggest adding CTCM to your watch list. It is an interesting opportunity to participate in the growing Russian TV ad market. At some price, the risk would be worth it. Love the way you think about and evaluate companies, absolutely amazing, and I highly recommended your site on my blog. I look forward to your future thoughts and analysis.